In 1969, two years before director Duncan Jones was born, David Bowie released the single, Space Oddity. 40 years later, Bowie’s son, Duncan Zowie Haywood Jones releases his own space oddity – the brilliant MOON, an intelligent, thoughtful, unsettling, dialogue-driven drama and the first true science fiction movie in a light year. This isn’t ARMAGEDDON or MISSION TO MARS, or even STAR WARS; MOON embraces the iconography of 2001: A SPACE ODYSSEY, SPACE:1999 and SILENT RUNNING. 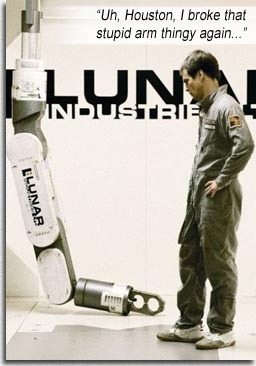 Sam Rockwell is astronaut Sam Bell, a lunar miner nearing the end of a three-year contract maintaining harvesters on the far side of the Moon, harvesting helium-3, a new energy source which has overjoyed Earth corporations. Sam has two weeks to go. And he is definitely losing his mind. … so he must contend with delayed messages from his beautiful wife and baby daughter whom he has never met. Sam’s only companion is GERTY, a HAL-like computer voiced by Kevin Spacey (who has a foreboding voice at the best of times – in a supercomputer that has control over your living conditions, it is downright jumpsuit-browning scary). Something is bugging Sam. He drives out to check on that harvester again – and finds the crashed rover. Inside – he finds himself. Literally. Without doubt, this is Sam Rockwell’s most inspired acting performance of his career. Like Michael Keaton in MULTIPLICITY or, to a lesser extent, Kevin Kline in DAVE, we lose cognizance of the constant camera trickery going on. Actively and passively, our eyes are being fooled by a combination of special effects, creative editing and sensational dual acting. But MOON’s underlying disturbing message is not the fact that clones exist – it is the fact that corporations will use this device to once again line their pockets and screw people over; how the bottom line overrides any kind of human element or ethics. That makes MOON a biting potent indictment of modern day corporate misconduct and dysfunction. The Space Oddity doesn’t fall far from the Starman. Writers: Duncan Jones, Nathan Parker. Starring: Sam Rockwell, Kevin Spacey, Dominique McElligott, Rosie Shaw, Kaya Scodelario, Benedict Wong, Matt Berry, Robin Chalk.